DHARAMSALA, INDIA — In Chinese-ruled Tibet, activists have used various means to protest policies that human rights groups say subjugate, and even destroy the Tibetan identity. Self-immolations are the latest method used by protesters to draw the world's attention to their plight, but activists are also embracing other kinds of resistance. That includes the lhakar movement, which emphasizes individual acts of protest through personal actions such as wearing traditional clothes, eating Tibetan food, listening to Tibetan music and teaching the native language to their children. Tamding Tsetan, a well-known artist who writes and performs folk songs, is one of the leading exponents of Tibetan heavy metal. 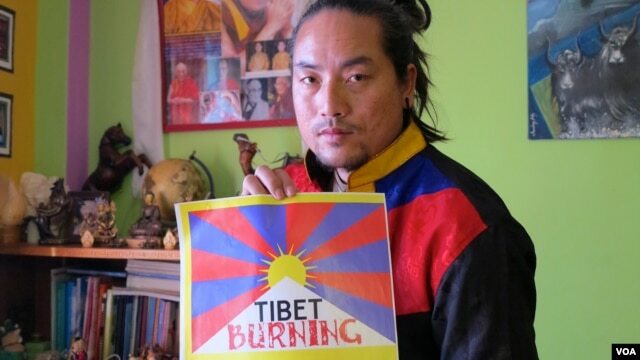 While Tamding represents the changing face of Tibetan protest, he supports the Dalai Lama’s continued espousal of the “Middle Way,” which includes Tibetan autonomy but not independence from China. However, not all Tibetans are content with the idea of living under Chinese rule. The most obvious manifestation of that fight is the ongoing campaign of self-immolations that has seen more than 100 Tibetans set themselves on fire to protest Chinese authority. However, organizations like SFT are keen to promote alternatives to direct action that are not only less radical, but difficult for Chinese law enforcement to disrupt. The lhakar movement is prime among them. Developed inside Tibet after the uprising of 2008 and more recently exported to the Tibetan Diaspora, Tseten says it challenges Chinese rule while simultaneously allowing Tibetans to assert their culture and identity within the letter of Chinese law. Activists see the lhakar movement not just as an evolution of the philosophy of passive resistance expounded by the likes of Mahatma Gandhi and Martin Luther King. Tseten says it can be used as a weapon by anyone who believes in the Tibetan cause. “By boycotting the Chinese economy and its influence on your country, you are actually supporting the Tibetan cause,” he says. After decades of living under Chinese rule, Tibetans say defending their identity, calling for improved rights and the return of the Dalai Lama, are acts which have united all Tibetans. Later this year, activists from the diaspora will hold a conference with other minority communities, including Uighurs and Mongolians, that are battling to preserve their identities under Chinese rule.